I know it's technically still winter but it's my birthday next Sunday and I want something party-ready and fun to wear. 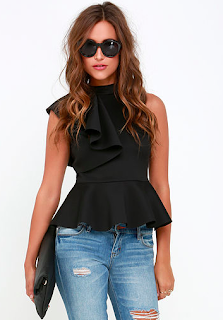 I really like peplum these days because when you get a fitted top it nips in and flares out at just the right place. Let's have some fun with peplum going out tops. If this isn't a birthday top, I don't know what is. 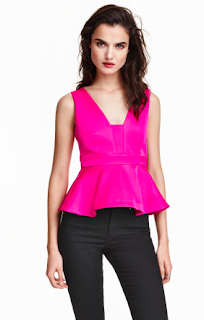 A pop of pink, feminine flare, and a daring but not scary neckline. Look at these lines! What a beautiful party or black tie top. Just needs the right accessories. You cannot beat this price. Grab it in the black too. What a statement top. 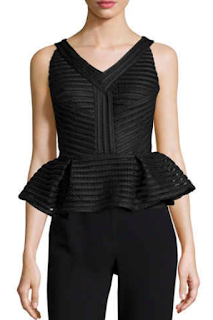 Look at the flowing ruffle starting at the neckline. Stunning. Sure it's still sweater weather, but sometimes I need a glimpse into the future. These sleeveless beauties are perfect for play and ready for party any day.